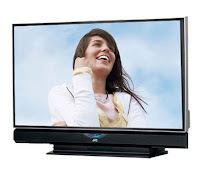 Plasma Television, Plasma Display, HDTV, Flat Screen Television, TFT Monitor, TFT Television, LCD Monitor, LCD Television, Reviews, Tips and Tutorial. Narrowly squeaking past the Toshiba to secure the first-runnerup spot, the JVC was this year’s polarizing choice. It had one firstplace vote, two for second place, and a fourth- and a fifth-place vote, as well. It all depended on what each reviewer valued—or was bothered by—the most. Older JVC RPTVs were known for having great processing—as well as pretty terrible black levels. Thankfully, this year’s models have an iris. You can adjust the iris for blistering light output, almost as much as the Samsung’s—or, even better, for the second best black level in the Face Off. All the while, the contrast ratio stays high, usually in the 5,000:1-to-6,000:1 range. This is an excellent implementation of an iris, allowing the JVC to have an extremely wide range of light-output options. Color wasn’t the JVC’s strong suit. The Sony set was less accurate, but, interestingly, because all of the Sony’s colors were off uniformly, it wasn’t as objectionable. The JVC,on the other hand, had a very oversaturated green, while blue and red were less so. Because of this imbalance, several judges commented that, even though it didn’t seem as oversaturated, it seemed more off. The remote, like all recent JVC remotes, has a lot of tiny, identical buttons. It’s hard to navigate, but at least it’s backlit. The menus, too, are the same as those found on previous models and really don’t complement this TV’s performance, price, or decade, for that matter. Oh, well; with any luck, you won’t have to use the menus often. The Theater Pro button on the remote puts the TV in a movie mode that drops the iris and color temperature down to theater-type levels. Without the iris, there is no doubt that this TV wouldn’t have ranked this highly. ith the competition so strong, this addition was a smart move for JVC. The excellent contrast ratio, black level, and processing make for a strong display. The color accuracy isn’t great, but it’s not as bad as that of some. Overall, JVC did a lot of things right, and the HD-61FN97 is a very highly performing runner-up. Any names that appear in this site may be trademarks/service marks/registered trademarks or copyrighted materials and are therefore the property of their respective owners.